By accessing any area of the FilmFastener.com web site, (the "Web Site") the user acknowledges this notice, and agrees to the terms and conditions, set out below. Except where stated otherwise, the terms "FilmFastener" and "BondKap™" used on the Web Site shall be deemed to include respective affiliates, subsidiaries, successors and assigns. 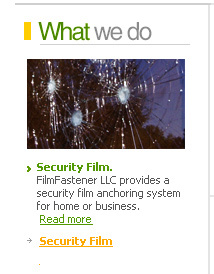 FilmFastener LLC owns and operates the FilmFastener.com and BondKap.com web sites. FilmFastener, BondKap and related words, domain names and logos are trademarks and the property of FilmFastener LLC. All other trademarks, product names and company names or logos cited herein are the property of their respective owners. The material contained on the FilmFastener.com web site, including all portions of the Web Site, content, site design, text, graphics and the selection and arrangement thereof are Copyright © FilmFastener LLC. All Rights Reserved. No material from the Web Site or any web site owned, operated, licensed or controlled by the FilmFastener.com web site or its licensors may be copied, reproduced, republished, posted, transmitted or distributed in any way. The user may print, in hard copy, portions of the Web Site only for the purpose of referencing the information offline. The use of any such material for any other reason, on any other web site, or the modification, distribution or republication of this material without prior written permission from FilmFastener LLC is strictly prohibited. The web site and the information or materials herein are provided on an "as is, where is" basis. The FilmFastener.com web site makes no representations or warranties, either expressed or implied, of any kind with respect to the web site or its contents. FilmFastener LLC disclaims all warranties, expressed or implied, including, but not limited to, merchantability and fitness for a particular purpose. By using or attempting to use the web site, the user expressly acknowledges that FilmFastener LLC makes no warranties or representations regarding the content of the web site: (i) There are no warranties or representations made regarding the content of the web site in terms of how current it is, its accuracy, or its completeness; and (ii) as a service to users of the web site, the FilmFastener.com web site may include links to other web sites over which FilmFastener LLC has no control. The FilmFastener.com web site provides no endorsement or representation of any kind regarding the products, services, content or appropriateness of content of such web sites, and the user hereby irrevocably waives any claim against FilmFastener LLC with respect to such web sites. The user acknowledges that any content, offers, information, opinions (including without limitation, reviews) ("Content") he or she may provide to the Web Site becomes the property of FilmFastener LLC, including all copyright, without reservation, and user waives in favor of FilmFastener LLC any and all moral rights in such Content. The user acknowledges and agrees that all or any portion of the Content may be used, edited, reproduced, published, translated, sublicensed, copied and distributed and/or incorporated into other works in any form, media, or technology now known or hereafter developed for the full term of any copyright that may exist in such Content, without compensation of any kind to the user. By submitting Content to the FilmFastener.com web site, the user automatically warrants that he/she has the full right and authority to submit such Content, and that none of such Content is subject to any copyright or other proprietary right of a third party. We are committed to the privacy of your personal information. The FilmFastener.com web site provides information to a wide range of individuals. In doing so, we may need to collect personal information for various reasons including: understanding your needs, meeting legal, regulatory and contractual requirements, to facilitate the delivery of products and services, to maintain your contact information, and to provide information to you. We do not disclose or sell your personal information to third parties. An individual's right to access their personal information is not absolute. We may deny access when denial of access is required or authorized by law, information relates to existing or anticipated legal proceedings, granting access would have an unreasonable impact on other people's privacy, to protect our company's rights and property or if the request is frivolous. Certain ethical, procedural and confidentiality rules may prevent access in certain circumstances.